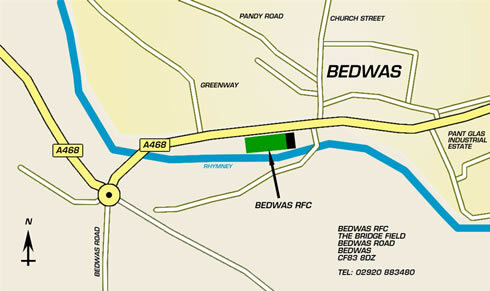 Bedwas is located 2 miles North East of Caerphilly on the A468, just 10 minutes from the M4. From Junction 28 of the M4 take the A4072 towards Bassaleg. After 3/4 Mile at the next roundabout take the Bassaleg exit and continue through the village on the A468. Continue along the A468 for 7 miles through the villages of Rhiwderin, Lower Machen, Machen and Trethomas. From Junction 32 of the M4 take the A470 north towards Pontypridd. After 2 miles take the A468 junction signposted for Nantgarw. Follow the A468 towards Caerphilly. Follow the A468 around Caerphilly for 4 miles and into the village of Bedwas.